February 1st, 2019 | blog | Comments Off on What is the best material for kitchen cabinets? When you’re planning a new kitchen installation, it’s important to keep track of the little details. Of course, you’ll have a grand design in mind. But it should be a functional and durable design. So you want a sink that’s easy to clean, a dining table with enough space for all the family – and reliable, custom kitchen cabinets. In today’s post, we take a look at materials. What should kitchen cabinets be made of? You need a strong material that will stand the test of time, while fitting in with the rest of your design. Steel or aluminum are popular choices for commercial and professional kitchens. Why? Because they are easy to clean, and never rust, stain or warp. However, they can look bleak. If you are planning a futuristic design full of white metal and black glass, go ahead. But in most kitchen designs, you should use steel and aluminum sparingly. Laminate is made of several layers of material, covered with plastic film. It’s highly durable, and you can choose almost any pattern or color. Make sure laminate cabinets are installed by highly skilled contractors, so that they can last as long as possible. Wood veneer is another “engineered” material for cabinets. Instead of a plastic veneer, the composite materials are covered with a thin layer of wood. But unlike laminate, it has a more natural look. You can choose between matte, gloss and high-gloss effects. Wood veneers are an affordable way to get a wood effect. However, they need regular polishing, and can get scratched. Wood is the often considered the best material for kitchen cabinets – and there are many good reasons why. It’s strong, durable, and naturally grows in many different colors and textures. It’s easy to clean, and add stains, varnish, or paint. If you plan to paint your cabinets, then maple, pine, or beech may be the best choice. For a natural look, choose the beautiful grain-patterns of oak, cherry, or mahogany. 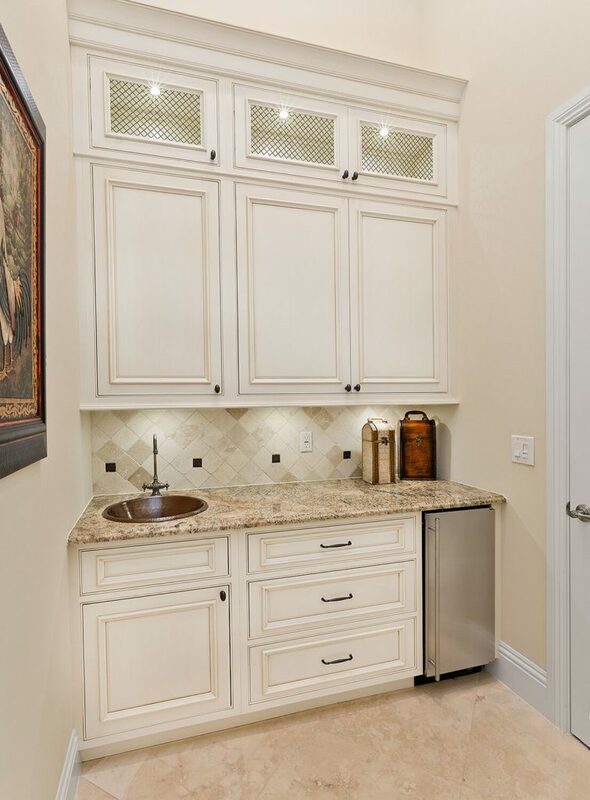 Whichever material you choose, consider DKB Cabinetry for your custom kitchen cabinets. Our expert designers and installers are waiting to meet you at our Boca Raton showroom.